- Fixed some bugs, thanks Syoudous! - Laser boss on the fifth level became stronger. Stable version. - SandStorm(Ultimate) will leave alive one zombie. This is done to ensure that humans are couldn't to kill all the zombies, for example on teleport. Thereby to start the round again. Small fixes. Changed the size of the map (-100 Mb). 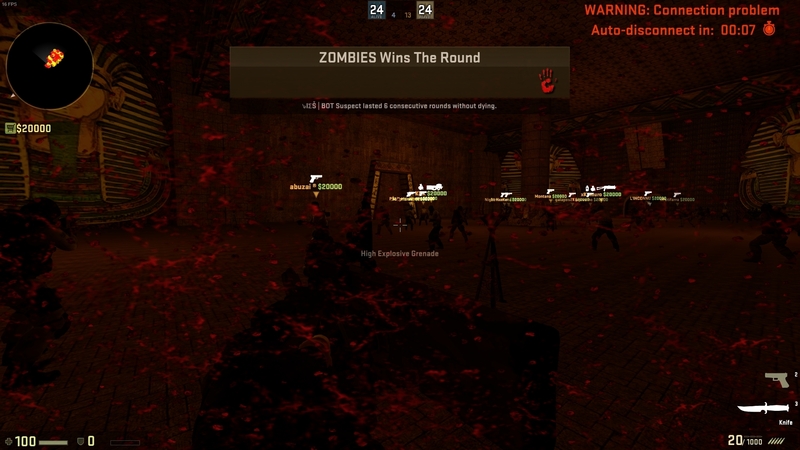 18.02.2017: SandStorm(Ultimate) will leave alive one zombie. This is done to ensure that humans are couldn't to kill all the zombies, for example on teleport. Thereby to start the round again. 08.03.2017: Laser boss on the fifth level became stronger. Thanks to everyone who helped to detect bugs. 1.) Music in map is not controlled by in-game settings. You need to stick music files in sound/music/* now. As an example, #stk/tsfh_inv.mp3 would be music/stk/tsfh_inv.mp3. This easily allows the maps music to be adjustable on the players end with no hassle. 2.) Consider compiling with HDR? You can make the most out of your map compiling only HDR. Granting you access to change "brightness" in your map, bloom, the rate at which HDR adjusts, etc. It looks good on all maps and it's highly customizeable. 3.) Water textures in map are dev_water variants. While they get the job done I'd like to mention that other water textures that look significantly better and can make the map stand out could help the map. inferno_water, water_aztec, boathouse_water as an example and many more. 4.) Props are dragged and dropped and not ported to CS:GO. While, yes, they do work and you seemingly have no issues... they can cause conflicts, producing client crashes. For CS:GO it's always a better bet to port the props properly under a different directory/path unique to your map so it does not clash with other possible mappers or Valve themselves in the future. The error above will spam repeatedly and the prop will not appear(!) 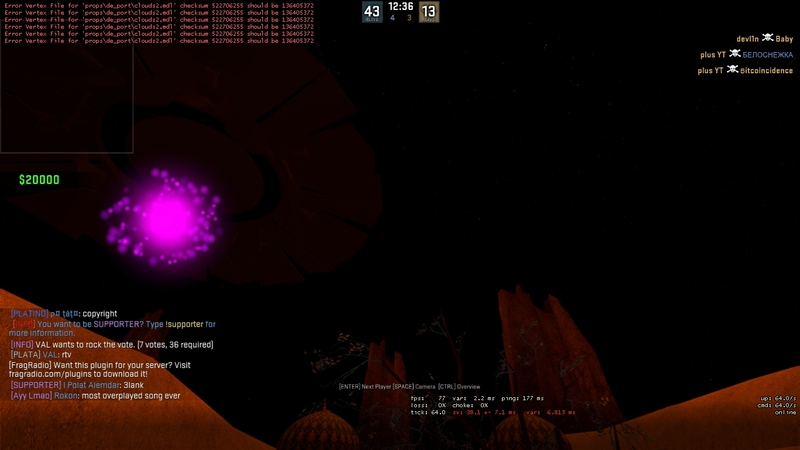 ingame as a result of it (See above screenshot). Crowbar is an easy tool to decompile and recompile props. 5.) Add and build cubemaps? Cubemaps are always a nice touch and very cheap. You can add as many as you want and the map can look great. Many maps are making use of it, why shouldn't yours? Even if your map has nothing reflective this also helps player models appear and look better! 6.) FPS is a bit down at times. Do you really need a very high emissive amount of particle effects going on at once? Are they absolutely necessary? Many of them I see could be toned down and little effect could be lost. Especially if you compile HDR above this also could make your effects stand out and you can tone everything down. 7.) For the above, explosion_huge was ported over? You should be using explosion_c4_500 for explosive effects as it's used by Valve and there for everyone. It would make your map look better in most areas than having a flat grey smoke sprite appear. It just doesn't look right. Mostly an opinion. 8.) Lack of radar? The map sort of needs it. It's not hard to make one and compared to CS:S you very much need one. Otherwise it's a chunk of space wasted and players guessing where other players are. 9.) Players teleported do not have their angles "snapped" where they should be seeing immediately. Simple enough, for all trigger_teleports set "Use Landmark Angles" -> Yes. This will snap players to what angles they should be looking at when teleported from a trigger_teleport. 10.) game_player_equip in spawn spawning multiple weapons and items on players is dangerous and for lower end servers, terribly laggy. Max edicts were reached resulting in the map crashing. Because you do not have "Strip All Weapons First" checked in flags these weapons can drop in spawn without even first removing the weapons the player starts with in a live server. That includes a knife and pistol always laying around in spawn. Ensure the flag is checked to prevent issues if a player is to be stripped. You should have only a weapon_knife and an item_assaultsuit equipped at round start only. item_assaultsuit is kevlar + helmet. game_player_equip has a bug in CS:GO which does not allow you to purchase kevlar in the buy menu. This would ensure it at least gets equipped once to make it repurchaseable later if they need it. Another players said laser boss life calculation area was wrong,Can you fix it?They said Calculation was Under the correct area. now this ver was too easy for laser,only one laser boss was die. can you add god penalty damage and delete electric like v7_2 ? err... this map has "func_client_crash". sometimes many players getting engine error and csgo gonna crash. Not sure if this is intentional but stage 2 boss doesn't move around / do anything... Bug or unfinished? Now map weight 195 mb. Should be no more than 149 MB, 150 MB and more is very bad for the map. Besides direct porting related bugs, your .bsp file should not exceed 150mb. CS:GO does not allow for maps larger than that to be compressed for FastDownload, so clients have to wait twice as much to download a map, also wasting server space. Given how careless mapping got in CS:S by the end of its active life, this should be easy to address. As you managed to slim it down 100mb in less than a day, I'm sure you won't have too much trouble in doing so. To clarify, your .bsp should be less than 150mb, not the zip/rar containing it (which will be even smaller). Regarding level systems, don't use add output origin based ones -- permanent entities behave differently in CS:GO on the server side.